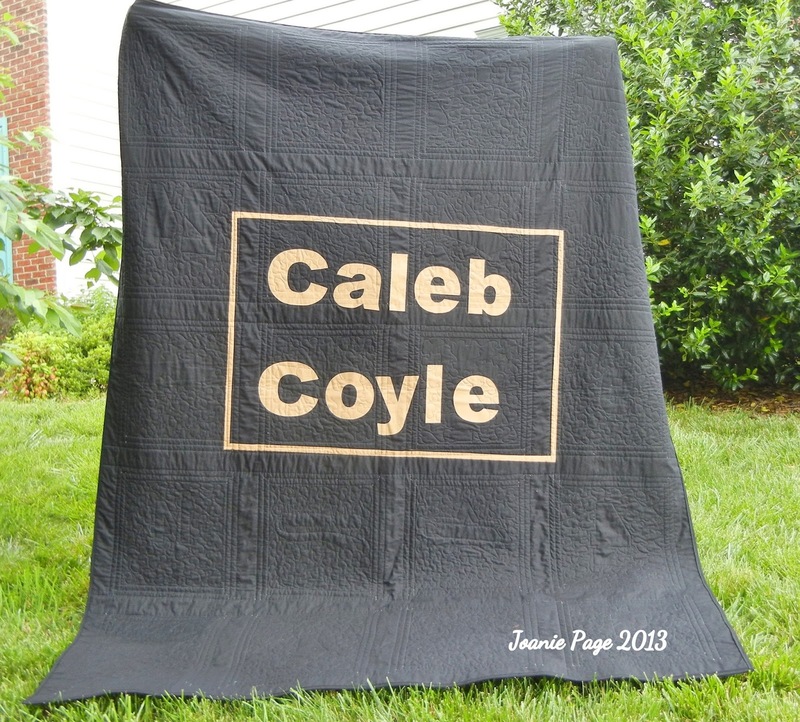 Joanie's Trendy Quilts : Another Quilt is Finished! It is 99.9 % finished and I am so pleased with the end results. It still needs a label. It has been designed but need to make a trip to the fabric store to purchase printable fabric sheets. Caleb, my grandson, did see it in the real on Mother's Day while visiting. He asked, " Does it need to be finished?" At that time it didn't have binding. "Yes it does need to be completed" I responded. The quilt was stitched in the ditch around the frames and around the pictures. The shirts were stippled, a large design of stipppling. I will be joining up with Connie's Linky Party today at Freemotion by the River! I've missed participating! And on May 31, 2013 I am linking with Link-A-Finish with Richard and Tanya Quilts. Thanks Richard and Tanya! Thank you Ty and Mindy for a lovely Mother's Day! 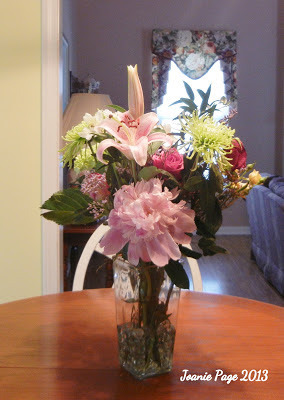 Vase of flowers that I brought home with me. Each side of the arrangement boasted of different and gorgeous flowers. 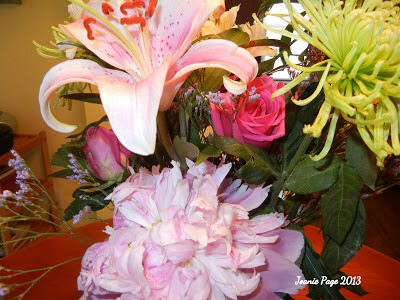 Beautiful roses, peonies, lilies on this side. Mini yellow roses, dark pink roses on this side! Love the way you have set the blocks with the shadow. Really sets them off nicely. Came out great! Caleb will treasure it! 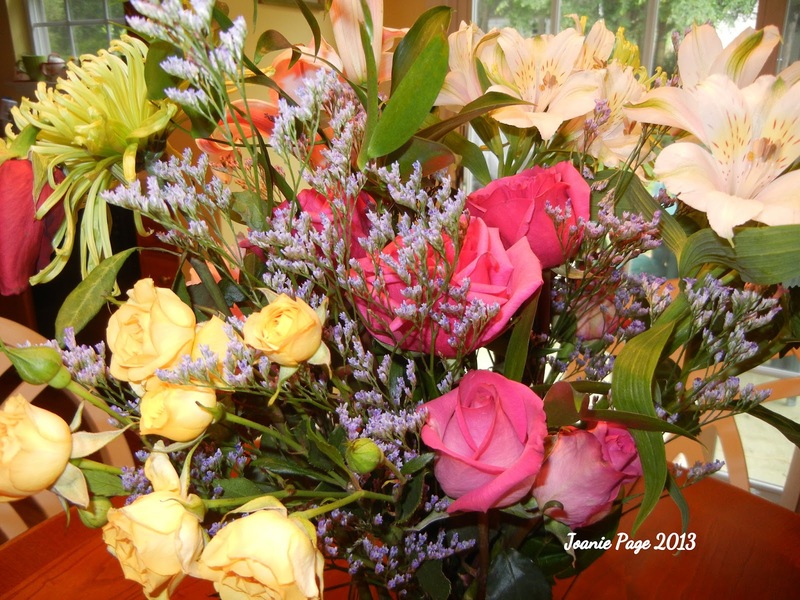 Your flowers are beautiful too! Super quilt. Especially love the shadow technique. Caleb will love it forever! What a fantastic quilt Joanie, Caleb will always treasure it. Love your flowers also! Thanks for sharing. What a great idea to add the shadow to the t-shirt blocks. Really like how it came out. A real treasure! 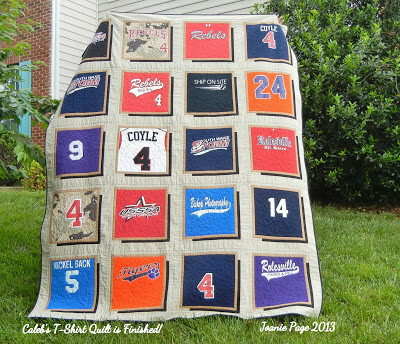 What a great quilt!! I like the name on the back and everything! I did 3 baby clothing quilts for a client and I am on my 4th. They can be quite challenging.